Please enjoy this article written by one of our 2017 University of Canberra interns, Georgia Niedermeier. Across two days, over the first weekend in April, 2017, more than 400 registered walkers took on various sections of the Canberra Centenary Trail for the annual Canberra Walking Festival. The festival is an event for all ages that undeniably lives up to that title. The youngest walker was 5 years old and the eldest, 92! Age did not hold the walkers back, with the 92-year-old returning from Saturday’s 5km walk before anyone else. The event boasted walkers from all over Australia as well as Russia, Germany, Netherlands, Norway, Korea, Vietnam and Czech Republic. Walks ranging from 5km to the huge 44km marathon were available to choose from. Most walkers participated in walks on both Saturday and Sunday, managing to pry themselves out of bed for an second big day of walking through the Nation’s Capital. The event has been running for 26 years and there are some who have participated from the get go. I had the absolute pleasure of being involved in this year’s event, as a University of Canberra intern, and took the time to talk with some walkers about why they love the festival. The most telling responses were generated by the question Why do you keep coming back? I was met with many incredulous looks, ‘Why wouldn’t I?’. The event is full of smiling faces, triumphant walkers, enthusiastic volunteers and an overall positive vibe. Why wouldn’t you come back? Why do they return though? One couple from Sydney has made the trip to Canberra 21 times. They love the event and think Canberra is a beautiful place to walk and stay on for a post festival bike ride. Canberra is a wonderful location and this year’s use of the Centenary Trail exhibited some of Canberra’s best offerings. One local voiced her love of Canberra’s history. She believes walking through it is one of the best ways to absorb all the city has to offer. Other responses centred around challenge, incentive, and sense of achievement, but the resounding consensus was that the community is one you want to be a part of. The walk is great exposure for Canberra as a tourist destination, with the trails taking walkers past some of Canberra’s tourism hubs. Some international walkers took the opportunity to stop in at the War Memorial during their walks while others were happy just ticking ‘see a kangaroo’ off their bucket list. Entrants up early on Sunday saw hot air balloons adorn the sky and walkers passing the Carillon around midday were treated to a recital. For those after a little more incentive and reward, the Canberra Walking Festival is a member event of The IML Walking Association. IML encourages walking around the world, with awards on offer for completing walks in multiple countries. This is not a competitive event, you do not have to be the fastest, strongest or fittest to feel the sense of victory that every walker exuded upon return to home base. After experiencing the event for myself I hope to see it grow and continue for years to come. It is a fantastic event full of wonderful people from all walks of life. Nellie’s Cafe and Bar (coffee van) will also be providing coffee ($3.50/$4.50), tea ($3.50) and milkshakes ($4) over the weekend. Feel free to bring your own reusable keep cup if you want to make a small contribution to the environment. The ACT region of the Conservation Council is offering a walk around the entire 306-kilometre border of the Australian Capital Territory! A Beginning Saturday, 7 October, the walk will conclude three weeks later, on Saturday, 28 October. This is a fundraising event for the Council and the walk will be led by regional president Rod Griffiths. 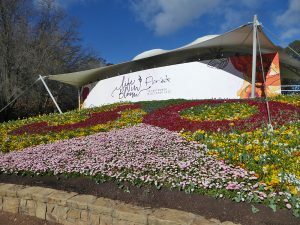 Floriade is on again in Canberra, and is celebrating its 30th birthday. This means that the Heart Foundation early bird walks are also on again, where you get the opportunity to complete a 45 minute walk around Floriade before the gates open to the general public. The walks are free, but a donation to the Heart Foundation is always appreciated – a collection tin is available at the walk. Floriade early bird walks start at 8am each Monday-Saturday of Floriade, which runs from 16 September to 15 October 2017. There are no early bird walks on Sunday. Each walk is approximately 2.5km. A number of AussieWalk and Walking For Pleasure members are assisting as volunteers to lead these walks, and we would love to see you there. 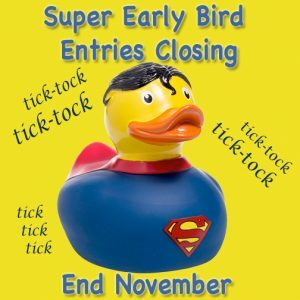 Saturday 23rd Sep: complete the early bird walk then a lap of the central basin of Lake Burley Griffin. Saturday 14th Oct: complete the early bird walk then a walk along Anzac Parade past the memorials, including two new memorials since we last walked here. We meet near the crossing on Commonwealth Avenue – see the blue flower on the map below. Arrive 5-10min early to sign in, so you are ready to start the walk at 8am. New AussieWalk Website Goes Live! The AussieWalk website has had a major overhaul to make it easier to read on multiple platforms. We’ve also updated the site with all the information about the new national AussieWalk IVV organisation. We invite you to have a look around and let us know what you think. You can make comments below (first select the “leave a comment” link above to open the comment box), or on our AussieWalk Facebook page, or via email. You can also sign up to our news emails on our Contact page. We expect there will be a few gremlins as we get accustomed to the new technology, so if you experience any problems with the new site please let us know.